2. Make an online payment of $190 online. This is the processing fee and you can make this payment by clicking here. 4. Once your application is processed, you will receive a confirmation e-mail from Campus France USA. Please remember that a printed version of this email will be requested at your visa appointment. We also recommend carrying this letter with you when you are travelling to France. You must be 18 years old, or older. You must have a clear idea regarding where and what you want to study. You must be accepted by the institution of your choice. The enrolment procedure can vary. For more information on how to enrol at French in Normandy and visa procedures that apply to our school, feel free to contact us: https://www.frenchinnormandy.com/contacts/ . We want to welcome you in Rouen and would be happy to assists you in this process. This isn’t only regarding your time in France, you should be polite wherever you go, of course. While speaking with French people you must always address them with their titles. An older woman should always be addressed as madame, a younger mademoiselle, and all men should be addressed with monsieur. Always use bonjour (good day), au revoir (good bye) and merci (thank you), even when entering shops, waiting rooms, offices, elevators etc. My advice for you will be to always be polite and use formalities in every given situation. I was told that German people don’t speak English with tourists, even if they speak the language (and trust me most of them do). But while visiting Germany, I concluded that this is not true at all. However, no one ever told me that generally French people don’t speak very much English, so when I visited France I was very surprised that the locals declined answering my questions in English. This is a big challenge for tourists, but as you will be studying French in France, I’m advising you to try and learn some of the basic phrases before studying abroad. Believe me, French people only do you a favor by not speaking English, this way you will learn French much faster! Understand more about French behaviour in public. If you are an American or Brit, you will immediately notice the difference in French behaviour, especially in public. In other cultures, people are noisy and direct, they don’t have problem maintaining eye contact and often speak loudly in public, while French people consider these behaviours inappropriate. In order to fit in to French society, my advice is to keep a low profile, speak calmly, be relaxed and not in a hurry to become friends with the French. Finding French friends and integrating into French society takes time, care and attention. As you will be living and studying in France and perhaps living with a host family, you will likely enjoy many traditional French meals. Remember, dinner is rarely served before 8pm. The French take great pride in what they serve as food and drink so respect needs to be shown not only to your hosts but also to the food being served! You should not start eating until after your host has started and be sure to reply “Bon appétit!” after your host has also said this. French people eat several courses during dinner, almost all of them accompanied with bread. During the meal, you should leave your bread on the table beside your plate and not on your plate. You should never eat cheese with your fingers, always use a fork and knife and don’t try to peel the “skin” off of any cheese! Keep in mind that French people consider dinner as the most important part of their day; they enjoy it a lot and may spend several hours having dinner and conversation. You should not rush or gulp your food and drink. Go slow, go hungry and enjoy! And if you’ve been invited, be sure to bring a small gift and send a thank you note. 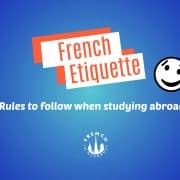 I hope that these French etiquette rules will help make your stay in France even more pleasant and comfortable. Very soon you will share my opinion that France is one of the most beautiful and romantic countries in the world. Bon séjour! Have a nice stay! If you’re thinking about studying French in France, join us in Rouen! Do you have top tip for immersing yourself in another language? There are many things you can do to help yourself improve your French language skills such as watching French television with French subtitles or listening to the radio. 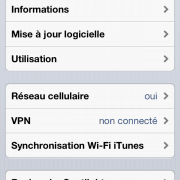 Today we suggest changing your phone settings “réglages” or “paramètres” to French! Leave a comment below and tell us your top language immersion tips! A joint program which allows students to know 2 regions of North and South France and 2 authentic cities: Rouen and Montpellier! Rouen, the birthplace of impressionism and historical capital of the Normandy (Joan of Arc, Flaubert, Victor Hugo and many treasures of architecture). Montpellier, an experience under the Mediterranean sun in a college town and a region that grouped many heritage sites of UNESCO (Carcassonne, St Guilhem, Nimes, Avignon, etc …). To learn and practice the language through grammar, vocabulary and expressions of everyday life. The methods are based on communication and specific needs. To make the most of your stay, a selection of activities and excursions are offered in each school. Rouen: Guided tour of the historic center, Mont St Michel, Monet’s House at Giverny gardens AND Basilica of Lisieux, Bayeux Tapestry, Normandy landing beaches of the Second World War the fishing port of Honfleur. Montpellier: Guided tour of the historical center of Nîmes AND visit the famous Pont du Gard, Carcassonne and its ramparts, Saint Guilhem, Barcelona, ​​Marseille, Roquefort (cheese tasting). Accent Français and French in Normandy offer a rich program of weekly activities and excursions such as afternoon cooking, wine tasting, dancing lessons traditional visits to local markets and castles, painting classes for painting including Monet! Do not forget to plan a weekend trip to Paris from Normandy and Montpellier! The price includes the course, fees, tests, materials and certificates. Renting a bicycle in Rouen is easier than you think! When it comes to getting around Rouen, a bicycle will be your ally for a day, a week or even an everyday companion! With 20 stations and 250 bicycles, cy’clic is a simple, self-serve bike rental system that meets all your needs. 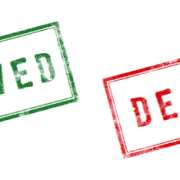 Subscriptions are flexible: you can choose between 1 day, 7 days, six months or a year. The first half hour is always FREE regardless of your subscription and the fees after that are nominal, increasing from €1 – €4 for additional time. 1- and 7-day rentals can be purchased at the self-serve automat at the bike station. 6- and 12-month subscriptions can be purchased online, when you will receive an account and activation number. You will need to pick up your free cy’clic card at the city hall (Hotel de Ville) and activate the card. Whether to enjoy the sights of Rouen, run errands or go to school or work you can always find a station in the city center and close to parks and residential areas. With a station every 300 to 400 meters, you can enjoy a new way of moving around the city. Download the map and find your nearest cy’clic bike today! Something smart if you want to go out! A bag for your French books, notebooks, maps etc. Think about bringing a small typical gift from your country to give your French host family and also bring some photos of your own family or town as this will give you something to start the conversation going!!! Make every effort to speak FRENCH at all times. 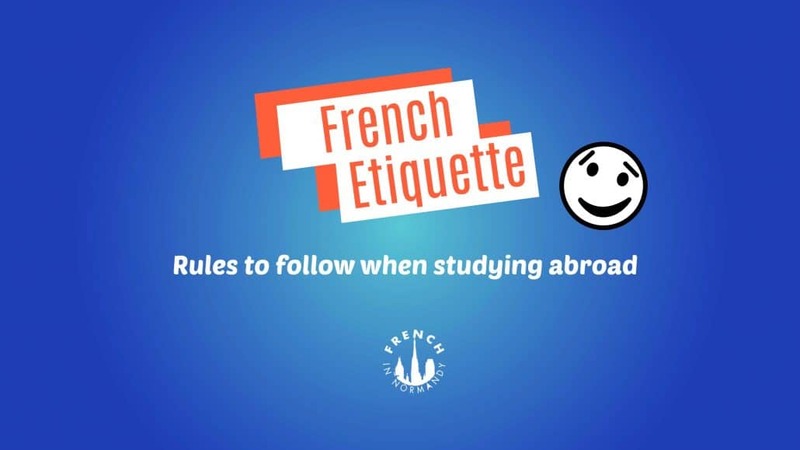 You will be staying as a part of a family to learn more about the French way of life but remember that you should respect your host family’s times for meals and their house!! If you have arranged to go out please remember to tell them and tell them if you are going to be late in!! Your host family will communicate with you in French at all times so that you make progress quickly. Don’t worry you will soon get the hang of it!! Full board at the weekends (or perhaps a picnic if you are going on our Saturday excursion). If you have any problems or questions relating to your host family just tell Véronique, she is the Well-Being Coordinator and in charge of host families here at FRENCH IN NORMANDY. Make sure that you have the FRENCH IN NORMANDY emergency number and the number of the taxi that is coming to fetch you at the airport. This information will have been sent to you or to your travel organisation ahead of time. If you are going to take the metro in Paris check that you know which line you need to take before getting on a train, if you need the timetable of trains ROUEN-PARIS just let us know and we will send you more detailed information. If you know which train you will be taking let us know and we will get your host family to meet you at the station. If you are going directly to your host family make sure that you have all the papers with their correct address and telephone numbers. If you are being met by your family at the station please let them and the French In Normandy team know the correct time of your train and please let us know if you miss it or if there are any problems en route. Please let us know well in advance if you have any special dietary needs or if you are allergic to pets/animals etc and also if you are a smoker. It is never very cold in Rouen even in the winter which is usually wet and sometimes windy so for winter months make sure that you have a warm waterproof jacket. Summers are usually pleasantly warm but one never knows so bring a coat just in case! Rouen has a tram system which we call «le metrobus », there is a stop just 8 minutes walk from the school which goes to the centre of town. Regular buses pass where French In Normandy is and many families are within walking distance of the school. On the first Monday of your stay, we will take you around the town so that you get your bearings. We will show you the principal sights as well as useful information such as where and how to buy a metro ticket or season card. A ticket costs 1,50 Euros. A pack of 10 costs 11,50 Euros. You can also buy season cards for longer stays. Lunch is not included in the programme unless you come as part of a group. Students at FRENCH IN NORMANDY can buy lunch from the many bakers shops (sandwichs/quiches/rolls) just 2 minutes walk from the school. There are cafés near the school where you can buy sandwiches or hot snacks and quick meals. In the school we have a hot and cold drinks vending machines and a snacks (crisps and sweets) vending machine. Students can eat in the common room. All the team at French in Normandy wish you “bon voyage et bon courage” and remember we are here to help you at all times. Enjoy your stay!! L’école French in Normandy m’ a conseillé de rester pendant mon séjour à Rouen avec une famille d’accueil, c’est vraiment la chose la plus importante pour moi. Pour commencer, ma famille est magnifique; elle m’ aide beaucoup à bien s’adapter ici à Rouen, elle s’occupe de tous les détails concernant les activités comme les endroits historique, les restaurants et les choses nécessaires pour la vie quotidienne.Je me sens vraiment comme chez moi !!! Ce que j’aime carrément , c’ est quand on mange ensemble pour le petit-déjeuner et le diner, parce qu’on a l’opportunité de discuter et échanger des idées dans tous les domaines et ça influence nos progrès en français. Reste à dire, la cuisine française est vraiment délicieuse ,spécialement les fromages, les crêpes et les gâteaux différents car on sent la gourmandise et le goût diffèrent qui n’ existe pas ailleurs.